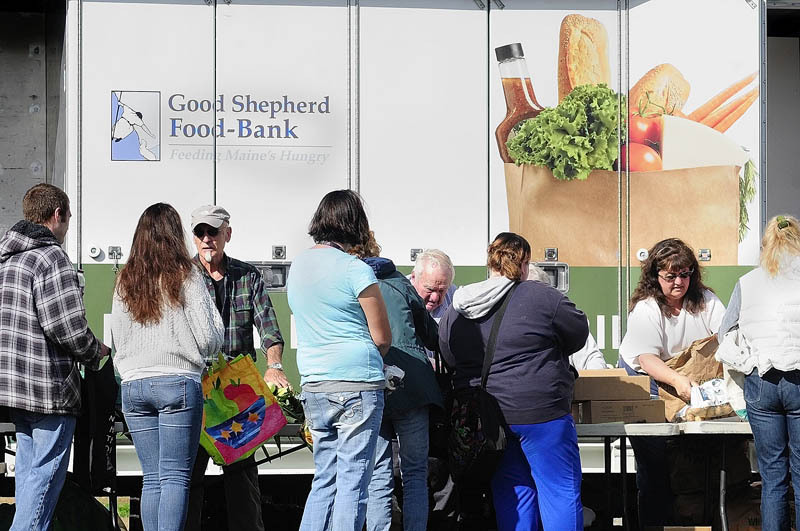 A truck, part of the Good Shepherd Food Bank program, distributed approximately 10,000 pounds of food Friday to hundreds of people in Augusta. AUGUSTA — Were it not for the food she picked up Friday from the Good Shepherd Food Bank’s food mobile, Joyce Sabins said she would be having crackers, peanut butter, and water for supper. 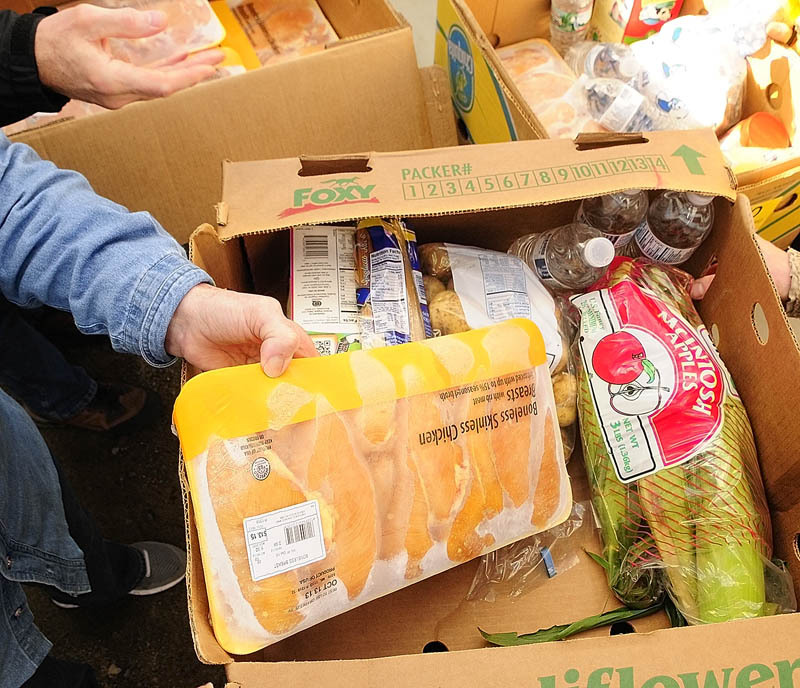 The 54-year-old Augusta resident said she came to the free food distribution for a simple reason — she needs food to get through the rest of the month. Without the help, she said, she’d have to go without something else, possibly including her medications. In a sign of the difficult times, Sabins, who lined up at 8 a.m. for the distribution which started at 10 a.m., was far, far, from alone at Mill Park Friday. 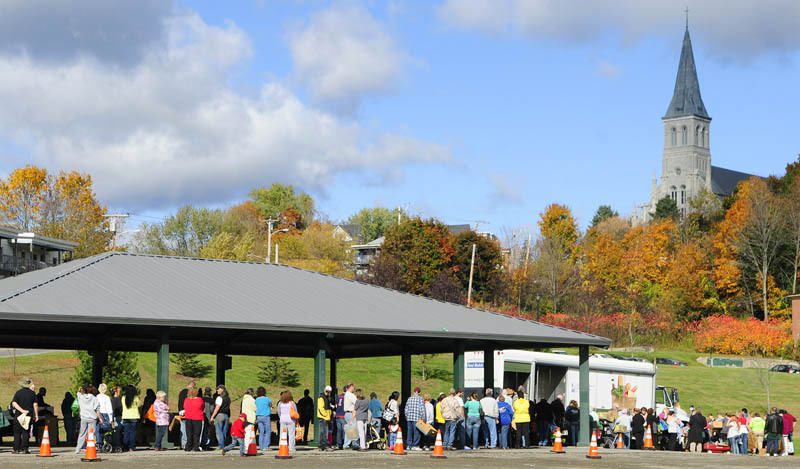 The line of people including those young and old, single, and entire families with young children, circled completely around the Mill Park pavilion, about 100 feet to the parking lot, and another 100-plus feet almost to the banks of the Kennebec River. More than 800 people went through the line between 10 a.m. and noon, according to Abigail Perry of the Augusta Food Bank. “You can see, by the number of people here, their needs aren’t being met,” Perry said. She said the 800 people were from 300 households, and 25 different municipalities. Organizers and volunteers gave out about 10,000 pounds of food. The truck full of food came as part of a Good Shepherd Food Bank program meant, organizers said, to expand its outreach to Maine’s neediest and most underserved families in communities where the demand for emergency and supplemental food has outgrown the capacity of local food pantries. As Sabins spoke while seated in a metal device which serves as both a walker and place to sit, her friend, Tayna Poissonnier, 30, who walks with a cane, asked her to lock the device in place so she could lean against her friend while they waited. The friends said when they don’t have enough food to make a meal, they’ll call each other, and combine what each has together to make a meal. Food available Friday included fresh produce such as tomatoes, corn on the cob and potatoes, chicken, milk, snacks, water, canned goods and bread. Some food items, such as the chicken, ran out before everyone went through the line, Perry said. She said the truck came at no cost to the Augusta Food Bank, courtesy of funding from the Doree Taylor Foundation. Recipients didn’t need to prove they were in need to get food because the distribution, organizers noted, was meant to be barrier free. Good Shepherd is the largest hunger relief program in Maine, distributing food to some 600 partner agencies. The Augusta Food Bank provides supplemental food to more than 350 families from Augusta and Manchester each month and is supported by 13 local church congregations, as well as businesses and individuals. The food bank at 9 Summer St. is open Monday to Thursday from 12:30 p.m. to 2 p.m. and Monday nights from 5:30 to 7.